Biotechnology company Genzyme (GENZ) is holding an analyst and investor meeting Monday focused on the commercial potential of its multiple sclerosis (MS) drug Campath. It's part of Genzyme's attempt to convince Sanofi-Aventis (SNY) that it's worth more than the Paris-based pharmaceutical giant has been offering. Sanofi and Cambridge, Mass.-based Genzyme have been butting heads for five months in acquisition negotiations. Last week, the French company extended its hostile takeover bid of $69 a share, or $18.5 billion in cash, for the U.S. company by six weeks. But the companies seemed far apart on price as ever. Genzyme has previously said that its Campath could generate peak annual sales of at least $3 billion. But Sanofi projects that number as closer to $700 million. Independent analysts put the figure somewhere in the middle, according to Reuters. Of course, this affect multiples. Under Sanofi's assumption, the multiples are very competitive at 18.5 times long-term earnings and 4.2 times long-term sales. These multiples take a hit under Genzyme's projections. One problem is that Campath, known generically as alemtuzumab, already brings in $110 million in annual sales as a cancer drug, but at a much lower price per dose than currently marketed MS drugs. But the rare-disease drugmaker has said it believes it could sell the drug at a higher price as a MS treatment, possibly by giving Campath away to cancer patients. 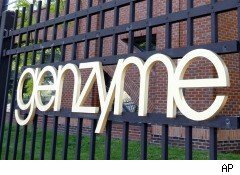 One option mentioned for addressing all these unknowns in the context of a merger is the use of contingent value rights: Genzyme shareholders could receive additional compensation later based on the future performance of Campath. While that's the direction many believe this is going, Sanofi would still need to increase its bid slightly, analysts believe, to seal the deal. Previously, analysts said they believed an agreement would be reached at between $75 and $80 a share. But with a contingent value rights plan in place, a deal might be reached for a share price in the low $70s. Update: In the two-hour presentation, Genzyme shared internal and independent, third-party analyses that support its expectations of peak sales of roughly $3 billion to $3.5 billion within five years of Campath's launch. The company expects to file for U.S. and EU approval in early 2012, and has been granted fast-track status by the FDA. Still, Genzyme shares fell 0.2%, closing below $70 at $69.65. It seems the company wasn't that convincing.